At the Garden of Eder we strongly recommend using pine bark mulch in your planting beds and around your trees. Aesthetically the rich brown color and wonderful pine tree smell make this an excellent mulch. With pine bark it goes beyond that. Pine bark can help lower the pH of your soil which can make growing conditions better for many types of plants. In Southeastern Wisconsin our soils are mostly alkaline or high pH making many plants difficult to grow. Rhododendron, azalea, hydrangea, and many evergreens would greatly benefit from the pH change that Pine Bark can make. Pine bark’s rich brown color is completely natural with no added dyes or paints. Most hardwood mulch is dyed to give it a red, brown, black, or even blue appearance and these dyes and paints may leach chemicals into your soil. As pine bark breaks down it helps add nutrients to your soil. Hardwood mulches actually rob nitrogen from your soil as they break down. This depletes your soil of the fertilizer and nutrients your plants need. The Cornelian cherry has yellow flowers in March or April, one of the first plants to flower in spring. 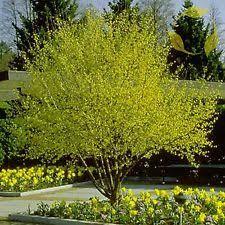 This large shrub or small tree is in the dogwood family and does not have the disease problems of flowering cherries. It is an excellent plant when used for privacy or as a stand-alone small specimen. The Cornelian cherry can reach 12 to 15 feet in height and 8 to 10 feet in width.